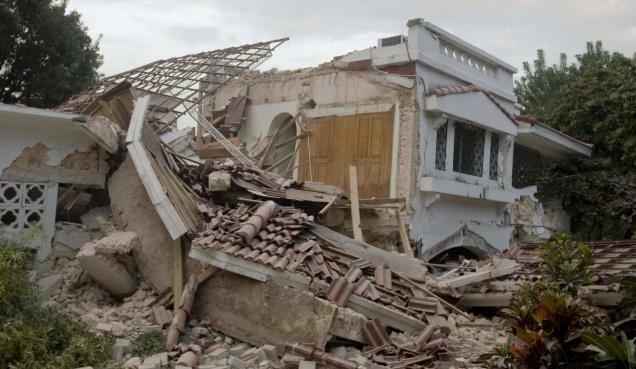 Did God Cause the Earthquake in Haiti? On January 12, 2010 an earthquake measuring 7.0 magnitude struck Haiti and killed more than 200,000 people while injuring more than 300,000. Over 15% of Haiti’s 10 million people were left homeless. My vocabulary is not adequate enough to describe the devastating effects of that event I have seen with my own eyes. And I have only seen a very small part. As a result of the earthquake the church I serve has become heavily involved in ministering in what is the poorest nation in the western hemisphere. Today I am middle of my third trip here. I am part of a team that is training Haitian pastors and church leaders. We are teaching on the doctrine of God. One of my lectures yesterday was on the knowledge and foreknowledge of God. Afterwards we had a Question and Answer session. All of the questions were thoughtful. In fact, they reflect a growth in doctrinal understanding among the pastors that is encouraging. The most poignant question that I received yesterday went like this: “If God exhaustively foreknows everything because He has decreed everything, then why did He decree sin to come into the world and was the earthquake His will?” Great question. Given the context, and the fact that I was looking into the eyes of church leaders who had lost family, friends, church members, houses, possessions and jobs because of the earthquake, I wanted my answer not only to pass theological muster but also to be pastorally faithful to the love and compassion of our all knowing, sovereign God. So after breathing a prayer for help, I answered by making four points. The sovereignty and wisdom of God assures this. Not only is He able to do all that He determines He will accomplish all that He has purposed (Isaiah 46:10-11). As the sovereign One, “the Lord by wisdom founded the earth; by understanding he established the heavens” (Proverbs 3:19). Though we may not be able to comprehend it, these truths about God assure us that this world, even with its evil and pain, is not an accident or failure on God’s part. Not only is this broken world a prelude to the new heavens and new earth that is to come, but we can see how even sin serves the purposes of God in creation. We would never know God’s mercy if we had not know sin. Neither good angels nor fallen angels have experiential knowledge of God’s mercy. The former do not need it and the latter have no provision for it. People who are redeemed by Jesus Christ have come to experience God’s grace and mercy through faith in Jesus. So we can see the wisdom and goodness of God in not preventing sin from entering into the world. Deuteronomy 29:29 is a verse that ever Christian should memorize. “The secret things belong to the Lord our God, but the things that are revealed belong to us and to our children forever, that we may do all the words of this law.” God has not revealed all of His ways to us. There are realities about His will and ways that are beyond our ability fully to understand. This should not surprise us because He is the great and glorious God and we have tiny little pea brains. He says, “For my thoughts are not your thoughts, neither are your ways my ways, declares the Lord. For as the heavens are higher than the earth, so are my ways higher than your ways and my thoughts than your thoughts” (Isaiah 55:8-9). As we put together all that the Bible says about the will of God we quickly are forced to acknowledge that we cannot think of it in simplistic terms. There is a secret will and a revealed will of God. His secret will is that which He has decreed—that He will infallibly bring to pass (as in Isaiah 46:10). But His revealed will is that which He has commanded us to be and do. In this sense one and the same event can be seen as both God’s (secret) will and a violation of God’s (revealed) will. I asked the pastors to raise their hands if they believed that the death of Jesus was the will of God. Most did. Then I asked those raise their hands who believed that the death of Jesus was not God’s will. A few did. I raised my own hand both times (as did some of the Haitian pastors). Acts 2:23 teaches us to view the death of Jesus in this way. “This Jesus, delivered up according to the definite plan and foreknowledge of God, you crucified and killed by the hands of lawless men.” His death was God’s will in that it happened “according to the definite plan and foreknowledge of God.” But Jesus’ death was not God’s will in that it was carried out “by the hands of lawless men” in violation of the sixth commandment that says, “You shall not murder.” So while we can and should grieve at every expression of brokenness and sinfulness in the world because it falls short of God’s revealed will, we also can and should take comfort in knowing that God is ruling and overruling every event no matter how lawless it may be. What is the most wicked, tragic event in human history? It is the death of the only righteous man who has ever lived. Compared to the cross of Jesus all other tragedies, both moral atrocities and natural disasters, pale in significance. Yet, we know that in the death of Jesus on the cross God was doing His deepest work of redemption. This assures us that in the midst of our own sorrows and sufferings God is also working. The promise of Romans 8:28 is unshakeable. “And we know that for those who love God all things work together for good, for those who are called according to his purpose.” This includes everything from earthquakes to cancer to betrayal. So in the midst of every tragedy God’s people should run to the cross of Jesus and be strengthened by the confidence of God’s wisdom, sovereignty and love that is displayed there. All of this helps us think biblically about any particular situation, even the horrific earthquake that shook Haiti nearly four years ago. So, without diminishing the heart-rending, life-altering realities of that tragedy, we can grieve over it with real hope—hope that is grounded in the certainty that our sovereign God was not taken off guard by it, but was ruling over it for purposes that will bring about greater displays of His glory and deeper dimensions spiritual benefit for His people.